This Aluminum Stage Plank allow for two people on a single plank. Designed for use with pump jack systems, ladder jacks, swing stages, and catwalks. OSHA approved for a crew of 1-2 workers. 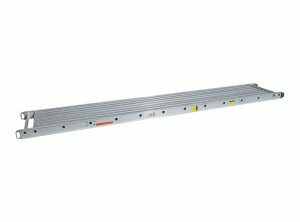 14″ wide and available in 12′, 16′, 20′, and 24′ lengths. Custom lengths can be special ordered. 20″ wide and available in 12′, 16′, 20′, and 24′ lengths. Custom lengths can be special ordered. 24″ wide and available in 12′, 16′, 20′, 24′, 28′ and 32′ lengths. Custom lengths can be special ordered.